Dhal Puri | Trinidad Split Pea Stuffed Flatbread is a Caribbean special flatbread made with split pea filling. 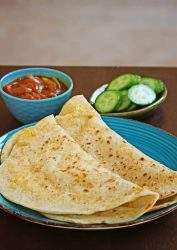 It is delicious with a mix of simple spices and is a vegan flatbread. Combine the ingredients mentioned for the dough and knead well to make a soft dough. The dough should be quite soft but not sticky. Let the dough rest for at least 30 minutes. Boil at least 6 cups of water. Add the measured chana dal / split pea to the boiling water along with the turmeric powder. Let the lentil cook just until tender. Do not let it become mushy. The split pea should still be holding its shape but should easily crumble when crushed between fingers. At this stage, drain the peas and let it thoroughly dry. I spread mine on a kitchen cloth to remove all the extra moisture. This step is very important to get a powdery filling. Otherwise, the filling will become too mushy and will be hard to roll. Place the dried and cooked peas, garlic, green chilies, cumin and salt in the food processor and make it into a fine powder. Flatten a ball to a size of a puri, about 4 inches in diameter and preferably thicker in the center and thinner on the outside. Stuff a heaping 3 TBSP of filling and bring the edges of the dough to the center and seal. The pictorials below and the video should help better to understand the shaping process. I also have a detailed video on YouTube. Dust the stuffed ball with enough flour and roll it into a thin flatbread. Make it as thin as possible without tearing the dough. Brush a skillet / pan with oil and place the rolled dough in the hot pan. Cook on both sides until golden brown, brushing with enough oil. Keep it warm in between layers of kitchen towel. Serve warm.